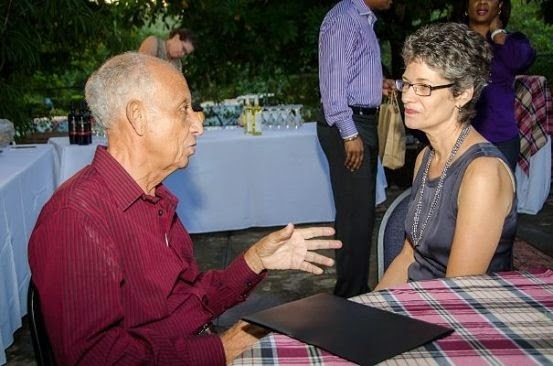 AUTHOR, AUTHOR: Baugh in conversation with fellow Jamaican scribe Diana Macaulay. On the occasion of a festival named in honour of one of our most revered cultural icons who is no longer with us, organizers and festivalgoers paused to pay stirring tribute to one who is. Literary luminary and orator Prof. Edward Baugh was the guest of honour at the enthralling and action-packed Aunty Roachy Literary, TV and Film Festival, the inaugural edition, which drew a sizable crowd to the Ranny Williams Entertainment Centre on Tuesday. "If Prof. Baugh read the supermarket list, it would sound like poetry," quipped Tanya Batson Savage, who moderated the afternoon session, which featured readings of classic Baugh verses by Mel Cooke and Poetry Society of Jamaica stalwarts Yasheka Graham and Michael 'M'Bala' Bailey. Baugh, whose most recent collection is the widely acclaimed Black Sand, also graced the mic to the delight of those in attendance, many of whom are huge fans of his stentorian tenor. But the salute to Baugh was just one of many highlights at the day-long Aunty Roachy Fest, a much-welcomed and cleverly conceived valentine to the memory and indelible contributions of Louise Bennett-Coverley. "A festival that inspires creativity in young people, something that Miss Lou encouraged, makes this an event she would have been proud to be associated with," remarked Prof. Mervyn Morris (author of Miss Lou: Louise Bennett and Jamaican Culture) during a 10-minute video presentation featured in the film and TV segment, where we got to relive the comical wonder of Oliver at Large, Titus In Town and Lime Tree Lane, and enjoyed exclusive bits of new and returning attractions like the refreshing, Neila Ebanks-hosted Jamaica Beat (centred on trends and achievements in the arts and lifestyle), Mi & Mi Kru, Nyammings, and CPTC's upcoming television adaptation of Basil Dawkins' Uptown Bangarang. Earlier, dramatic readings from Karl Williams' The Black That I Am (Patria-Kaye Aarons in the spotlight) and Honor Ford-Smith's Fallen Angel (with Marguerite Newland and Zandriann Maye) kept patrons engaged. So too did recitals from National Creative Writing Competition gold medallists and an insightful panel discussion on the state of the book industry.